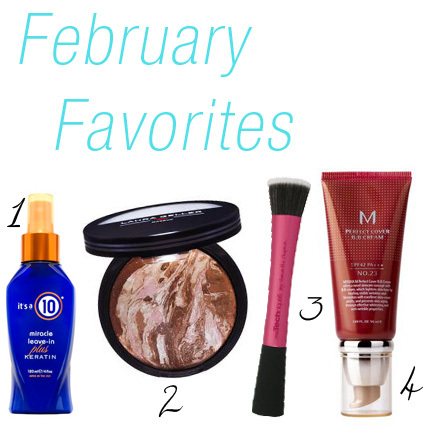 I thought I would share some of my favorite products that I used the most during the month of February! Enjoy! 1. It's a 10 miracle leave in product Plus Keratin - I have been using this leave in conditioner for a while now, but I just recently purchased the one with keratin in it and turns out it's even better than the first one! I spray it all over my towel dried hair and them brush it through. I have long, very thick hair and this helps with tangles, as a heat protector, and makes my hair super shiny!! I love love this product, it's much better than using 5 different products when this one can do it all. p.s They also just came out with a lite version for those of you with thinner or short hair! I bought mine from Ulta (which I just found out you can only get in their stores and not online) or your hair salon might carry it, I have also seen it at Walmart and CVS! If not any of those, click here to go to the It's a 10 website and find the nearest retailer! 2. Laura Geller's Bronze N Brighten (Fair) - I used to use the Nars Laguna Bronzer, I bought it simply because I had heard amazing things about it! I have to be honest I never really understood what all the hype was about after using it. I didn't think that it blended very well on the face nor was it very pigmented. I bought this after I tried some of my step-mom's and instantly fell in love! It is a baked bronzer and has multiple colors (pinks, browns, skin tone) mixed together to create the perfect color. It has very small shimmers, which I usually wouldn't like but you really can't see them on the face unless you are in direct sunlight and even then they just make your face glow! It's blends beautifully and adds just the right about of bronze to where you don't end up looking like an oompa loompa! 3. Real Technique Stippling Brush - I first saw these brushes on the PixieWoo blog and didn't even realize that Samantha Chapman (one of the two sisters, and makeup artist on pixiewoo) created them! Then when I saw that my lovely roommate, Rachel, had this brush I knew I had to try it out! I had been using Sonia Kashuk's version of the beauty blender sponge to apply my foundation. Even though I still love this sponge for my concealer, I love love love my Real Techniques Stippling brush to blend my liquid foundation all over. It really does create a lovely natural, airbrush finish to your skin. Not only do they do a great job, and are of amazing quality, they are SUPER affordable!! This brush is only $9.99, which for the quality level of these brushes, is fantastic! I got mine at Ulta, where they also have some nice sets for $17.99 or you can order straight from the Real Techniques' website where they have awesome tutorials where Samantha Chapman herself tells you how to all the different brushes! 4. Missha Perfect Cover Blemish Balm - I found this while researching the new hype about BB creams and what they are all about. BB creams have just become a thing in the U.S. but have been popular is Asia for a while now. They were first created by dermatologists to treat and protect skin after skin/laser surgery. Now companies like Smashbox, Estee Lauder, Clinique, and many more all have their own version of a BB cream. I love this because it's lightweight, but gives a very good amount of coverage. Because I have been breaking out a lot lately (thank you school) I have been wanting something with more coverage than a tinted moisturizer. It is also supposed to help lighten dark spots, cover redness and other discolorations in skin tone, help with acne, anti aging benefits, and finally UV protection! I got shade #21, just to warn you it does have a gray undertone to it but I don't think it stands out after oxidizing on the skin. I got mine from Amazon where I found it for an amazing price of $9.99, or here is the link to the Missha website where they have other formulations of BB creams. Thanks for reading! I know that was a mouth full! Have you tried any of these products? Comment to let me know what you think! Are you going to be posting any video's on using the products that you are blogging about? 'm new to blogging, so i'm just figuring everything out! But yes I can definitely start doing videos showing how I use the products! Anything particular?